Mitsubishi G4M (japonsko: 一式陸上攻撃機, 一式陸攻 Išiki rikujō kōgeki ki, Išikirikkō; zahodna oznaka: Betty; vzdevek: hamaki - cigara) je bil japonski dvomotorni srednje težki bombnik iz 2. svetovne vojne. G4M je bil sposobno letalo, bil je lahek in je imel velik dolet, je pa bil skoraj povsem brez zaščite (oklepa) za posadko. To je bilo tudi osebno letalo velikega japoskega admirala Isorokuja Jamamota. V njem je 18. aprila 1943 na otoku Bougainville v Solomonovem otočju po sestrelitvi tudi umrl. Ostanki njegovega letala so še danes vidni v džungli, kjer je strmoglavilo. Aoki, Hideo. "Kugisho Suicide Attacker "Oka" (MXY7) Baka." Airreview's Japanese Navy Aircraft In The Pacific War. Tokyo: Kantosha Co. Ltd., 1972. Aoki, Hideo. "Mitsubishi Type 1 Attack Bomber (G4M) Betty." Airreview's Japanese Navy Aircraft In The Pacific War. Tokyo: Kantosha Co. Ltd., 1972. Bridgwater, H.C.; Scott, Peter (2001). Combat Colours Number 4: Pearl Harbor and Beyond, December 1941 to May 1942. Luton, Bedfordshire: Guideline Publications. ISBN 0-9539040-6-7. Chant, Chris. Aircraft Of World War Two. London: Grange Books PLC., 2001. ISBN 1-84084-329-2. Ferkl, Martin. Mitsubishi G4M Betty (in English). Praha, Czech Republic: Revi Publications, 2002. ISBN 80-85957-09-4. Francillon, PhD., René J. Imperial Japanese Navy Bombers of World War Two. Windsor, Berkshire, UK: Hylton Lacy Publishers Ltd., 1969. ISBN 0-85064-022-9. Francillon, René J. (1979). Japanese Aircraft of the Pacific War. (2 izd.). London: Putnam & Company Ltd. COBISS 10134043. ISBN 0-370-30251-6. Francillon, PhD., René J. Mitsubishi G4M "Betty" & Okha Bomb (Aircraft in Profile 210). Windsor, Berkshire, UK: Profile Publications Ltd., 1971. Fumio, Iwaya. Chuko (Medium Attack Bomber). Tokyo: Hara Shobo, 1958. Green, William (1975). Famous Bombers of the Second World War. (3 izd.). London : Macdonald and Jane's. COBISS 26411013. ISBN 0-356-08333-0. Gunston, Bill. The Illustrated Encyclopedia of Combat Aircraft of World War II. London: Salamander Books Ltd., (Third impression ) 1979. ISBN 0-89673-000-X. Horodyski, Joseph M. "British Gamble In Asian Waters". Military Heritage. Volume 3, No. 3, December 2001, pp. 68–77. (sinking of the British battleship Prince of Wales and battlecruiser Repulse by Japanese on 10 December 1941 upon U.S. entry into World War II). Morgan, Eric B. "Mitsubishi G4M Betty." Twentyfirst Profile, Vol. 2, No. 17. New Milton, Hantfordshire, UK: 21st Profile Ltd., ISBN 0961812011. Nowicki, Jacek. 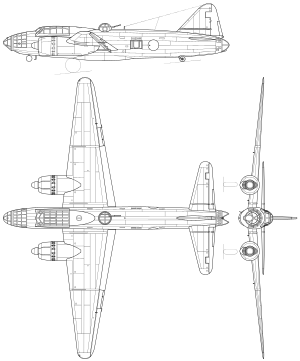 Mitsubishi G4M "Betty" (in Polish). Warszawa, Poland: Wydawnictwo Militaria, 1998. ISBN 83-7219-020-8. Tagaya, Osamu. Mitsubishi Type 1 Rikko Betty Units of World War 2. London: Osprey Publishing, 2001. ISBN 1-84176-082-X. Thorpe, Donald W. (1977). Japanese Naval Air Force Camouflage and Markings World War II. Fallbrook, California; Aero Publishers Inc. ISBN 0-8168-6583-3. Čas zadnje spremembe strani: 18:25, 8. januar 2019.